People commute in central Pyongyang, North Korea (April 12, 2017). On March 6, 2017, the Democratic People’s Republic of Korea (DPRK) launched four ballistic missiles, three of which landed 200 miles off Japan’s coastline. DPRK supreme leader Kim Jong-un promises that his country will eventually have nuclear-armed, intercontinental ballistic missiles that can reach the continental United States. The Trump Administration is currently reviewing its policy options, including preemptive strikes or total isolation of the North Korean economy. Since 2012, Kim Jong-un has pursued a dual strategy of nuclear deterrence and Chinese-style economic reforms. The prudent response of liberal democracies is to contain the military ambitions of North Korea and to support the belated integration of its citizens into global society. For instance, the United States and its Asian allies could continue their strategy of overt (e.g., deploying the Terminal High Altitude Area Defense system in South Korea) and covert (e.g., cyber warfare) actions against the DPRK military. At the same time, we should endorse the regime’s move to a decentralized, market economy, such as increasing the legal autonomy of business enterprises and allowing farmers private plots or pojon (vegetable gardens). Kim is belatedly recognizing and legalizing the people’s de facto transition to a market economy, a process already started during his father Kim Jong-il’s regime. The collapse of the Soviet Union and the devastating famine in the 1990s destroyed much of the top-down, governmental distribution system. To survive, ordinary North Koreans created non-governmental markets for goods and services, at first rudimentary and illegal, later more sophisticated and (at least partially) legal (Andrei Lankov analyzes the transformation in Real North Korea; Felix Abt offers a first-hand account in Capitalist in North Korea). With economic recovery and growth, the DPRK has developed an expansive transportation system and a nationwide cellular network (with more than 3 million subscribers), both of which further the flow of goods and information. North Koreans are increasingly aware and desiring of goods, information, and personal contacts from the outside world. Economic reforms offer legal space for foreign tourists, volunteers, businesses, and NGOs to contribute to social and economic development and to interact with ordinary citizens. Jamie Kim (director of Reah International) has documented about 4,000 activities carried out by 500 Western organizations (governmental, nongovernmental, and private) from 2005 to 2012. Significantly, these organizations included about 50, mostly small-staffed and U.S.-registered, faith-based organizations (FBOs), such as the American Friends Service Committee, the Eugene Bell Foundation, Christian Friends of Korea, and Global Resource Services. 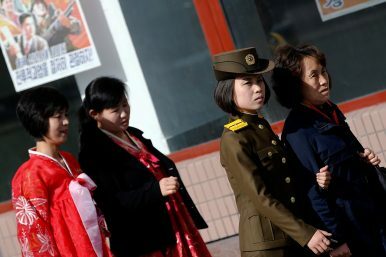 Since 2012, many secular organizations have left North Korea, because of international sanctions and the reduction of Western government funding. Faith-based organizations receive donations and voluntary labor from Christians, and are relatively immune to the vagaries of government funding. Probably the most famous, faith-based operation is the Pyongyang University of Science and Technology, established in 2010. North Korea’s first private university, PUST is largely funded by evangelical Christians in South Korea, the United States, and other countries. About 60 foreign, Christian volunteer professors instruct 500 undergraduate and 90 graduate students, who represent the academic elite of North Korea. A few students receive scholarships to study abroad in prestigious universities (e.g., University of Westminster and Cambridge University in Britain and Uppsala University in Sweden). PUST has received much media coverage and controversy, including a BBC documentary. Former PUST instructors, such as Helen Kibby from New Zealand, have also uploaded their own YouTube videos. Although foreign faculty and North Korean students are both pretty guarded in general, their interaction is changing year by year. After PUST was opened in 2010, students didn’t talk much with professors outside their classrooms for a while. As time went by, they could build up trust with each other to some degree and the campus atmosphere got to warm up. That has helped them become more open to have closer conversations. Dynamic interaction between faculty and students happens during different contexts: class, lab and research, advising students, thesis defense, events and contests, sports day, eating lunch and dinner together at the cafeteria, etc. Nevertheless there are always certain boundaries that they both are aware of to respect and protect each other overall. The numbers and activities of FBOs have increased in recent years, especially entrepreneurs who combine nonprofit and business activities. Gabe* (from the United States) organized North Korea’s first surfing camp in partnership with the state-run Korea International Travel Company and an American FBO, Surfing the Nations. The initial camp, which ran from July 28 to August 6, 2014, attracted 19 surfers, instructors, and safety personnel from the United States, Sweden, Switzerland, Denmark, and Australia to North Korea’s east coast. The summer camp offers surfing and skating lessons and other cultural exchanges between local residents and foreign visitors. On August 2016, celebrity British vlogger Louis John Cole posted a YouTube video about the surfing camp, which attracted more than 700,000 views and global media controversy. Less publicized are the hundreds of small groups that legally visit North Korea through tourism companies. Kevin* (from the United States) participated in a 16-person tour group, which planted 2,000 trees and conversed with students in English at a foreign language middle school in the Rason region near the Chinese border. Kevin was one of around 100,000 annual tourists to North Korea, the vast majority of whom are Chinese. Kevin, Helen, Gabe, and Louis all reported a deep longing among North Koreans, especially the younger and more-educated, to better themselves and to engage the outside world. They wish to inspire millions more international tourists, volunteers, and businesses to come to North Korea, develop its economy, and befriend its people. A large academic literature finds a positive, symbiotic relationship between economic development and liberal democracy. In particular, the growth of a stable, middle class generates powerful demands for the rule of law (not of arbitrary rulers), more popular participation in politics, and resistance to military adventurism. Other literature stresses the moderating effects of interpersonal contact. People get to know each other as individuals, rather than as representatives of disliked groups; these personal relations of trust and friendship erode one’s prejudices. Any interaction between North Koreans and the outside world that increases information exchange and economic opportunity should be welcomed: these are the seeds that with time and nurturing sprout into stout trees of liberty. Andrei Lankov reminds that the transformation of the former Soviet Union ultimately came from within, from citizens who were exposed first-hand to the West. Notably, two Soviet students selected by Moscow for the first study abroad in the United States in 1958 ultimately became the top leaders of the perestroika reforms in the late 1980s. Both men later said that their one-year experiences in the United States changed the way they saw the world. The Trump administration should remember the enduring lure and power of liberty and the hunger of ordinary people to better their lives. As the administration pursues a “big deal” to contain the DPRK’s nuclear weapons, it should also support opportunities for ordinary North Koreans to trade, attend school, sell their produce, make foreign friends, and generally negotiate a million other “deals” to better their lives. American hard-liners claim that enhanced sanctions forced Iran to the negotiating table and will do the same to North Korea. Iran is not a useful analogy. Iran possesses the most powerful military in the Middle East (outside of Israel) and lacks a credible military threat from any its immediate neighbors (especially after the United States conveniently ousted Iraq’s Saddam Hussein). Its regime survival does not depend on a nuclear deterrent. In contrast, the DPRK regime feels incredibly vulnerable from the United States and its Asian allies and absolutely believes that obtaining nuclear weapons is its only means of survival. A better analogy for American policymakers is Pakistan, another historically poor, historically authoritarian country that believes nuclear weapons are necessary protection against more powerful neighbors (notably India). In fact, India’s 1971 military intervention in Pakistan’s civil war (which helped Pakistan’s eastern state become independent Bangladesh) spurred Pakistani Prime Minister Zulfikar Ali Bhutto to start the nuclear weapons program as a matter of national survival. Washington has yet to finalize a deal to satisfactorily contain Islamabad’s nuclear and missile program, or even secure such materials from potential proliferation or theft. Still, the United States maintains trade and diplomatic dialogue with Pakistan, which has contributed to its stability and an expanding middle class. Growing the middle classes of Pakistan and its neighbor India are ultimately the most effective path to moderate each country’s politics and to limit the risks of military adventurism, state failure, and terrorism. Likewise, we advise the Trump Administration to engage in targeted or “smart” sanctions that would contain DPRK nuclear and missile programs, but not the socio-economic aspirations of its emerging, entrepreneurial middle class. As the Trump administration reviews its policy options, it would benefit from credible, first-hand information about what is actually happening inside the DPRK. The administration should be cautious about the testimonies of “celebrity defectors” who receive financial incentives to depict the DPRK regime in a negative, sensational manner (for example, stories of Christians being murdered with molten iron in political prison camps). More credible and objective testimonials come from ordinary North Korean refugees (most of whom left the DPRK for better economic opportunities, not because of political dissent) and Americans who have extensively worked in the DPRK. American NGOs are among the most active contributors to the peaceful development of North Korea. They have witnessed tremendous changes in the past two decades and expect even more in upcoming decades, culminating with the peaceful unification of North and South Korea. They should share their experiences with their fellow Americans and assist the Trump administration to exercise wise, prudent judgment on behalf of the people of North Korea. Joseph Yi is associate professor of political science at Hanyang University. Byeonggeun Heo is a student at Hanyang University. Junbeom Bahk graduated from Vanderbilt University. This article was supported by the Hanyang University Research Fund. Tempting though the prospect might be, it is highly unlikely.